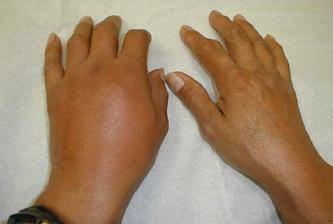 The symptoms of gout are; swelling, redness, hot to touch, stiffness, inflammation, and of course, excruciating pain. 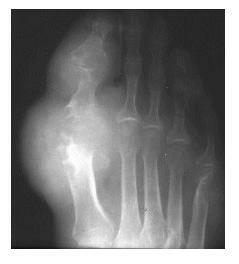 These can appear in almost any part of the body, but the big toe joint is the most common by far. Estimates put the figure between 75% and 90% for gout symptoms there. But they can also occur in the ankle, the tendons at the side of the foot, the knee, wrist, hand, fingers, elbow, and so on. Gout symptoms are a direct result of your body's own natural defences fighting against the uric acid crystals which have formed in the joints and causing gout. The danger with frequently recurring gout symptoms over a period of time, is that they can cause you to have permanently damaged joints, kidney stones, other kidney problems, high blood pressure, stroke, heart disease, and a higher risk of death. So not only is it important to eliminate the pain of gout, it's also very important that you take steps to ensure that you prevent future gout attacks. The problem in diagnosing gout is that the symptoms can be similar to other conditions such as an injury or infection for example. The doctor will normally use a physical examination in concert with the knowledge of the patient's medical history and family history. 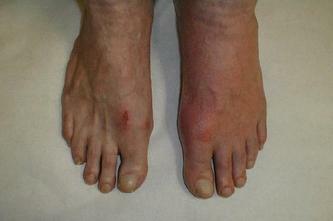 For example, someone with a history of arthritis or gout in the family has a higher chance of getting gout than normal. Blood tests can also be used to measure uric acid levels, as well as taking fluid from the affected joint to look for uric acid crystals under the microscope. If you suspect you could be suffering from gout then consult your doctor as quickly as you can for a professional diagnosis. The sooner the condition is diagnosed the sooner you can start working on relieving discomfort and shortening the length of the attack.